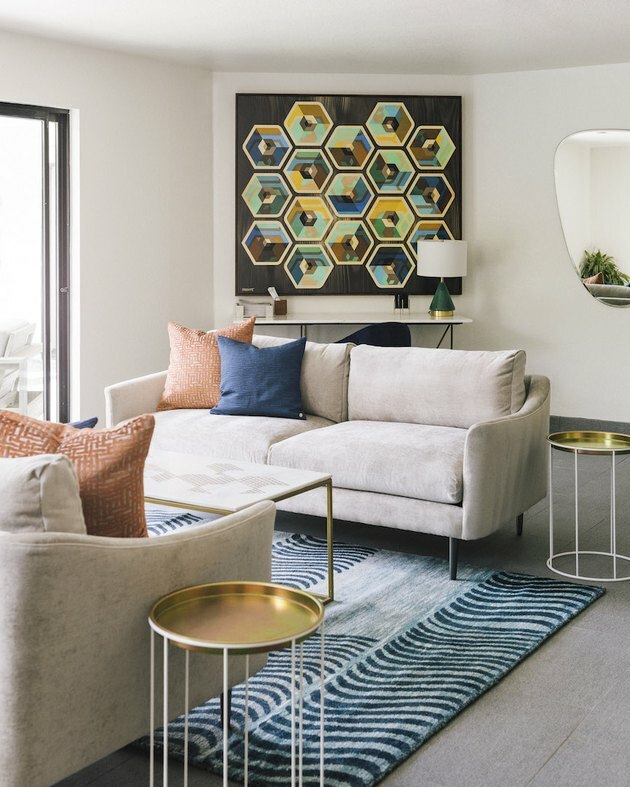 Palm Springs' low-slung buildings, midcentury modern architecture, and rainbow of vivid colors proved to be an ideal match for West Elm's modern, clean lines. 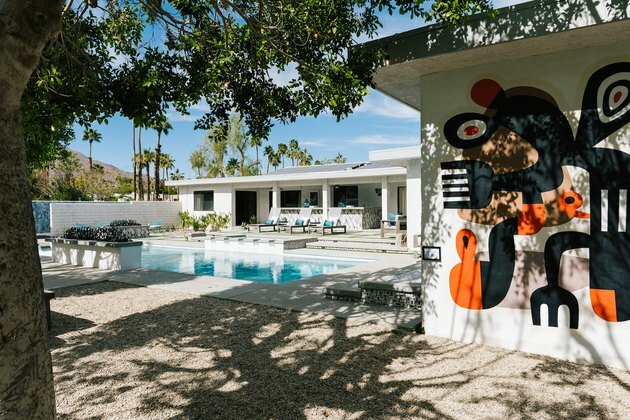 In late February — on the heels of Palm Springs Modernism Week — the retailer debuted the 2018 West Elm Pool House, a project that artfully blends its furnishings and decorative arts with the landscape. 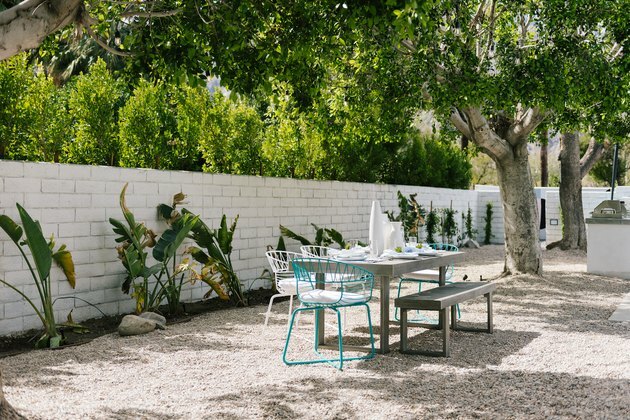 Located in the Movie Colony neighborhood, once home to Hollywood celebs like Marilyn Monroe and Cary Grant, the four-bedroom, 2,700-square-foot pad built in the 1970s features a sweet pool that includes a full bar, outdoor shower with artist-made murals, and two fireplaces. 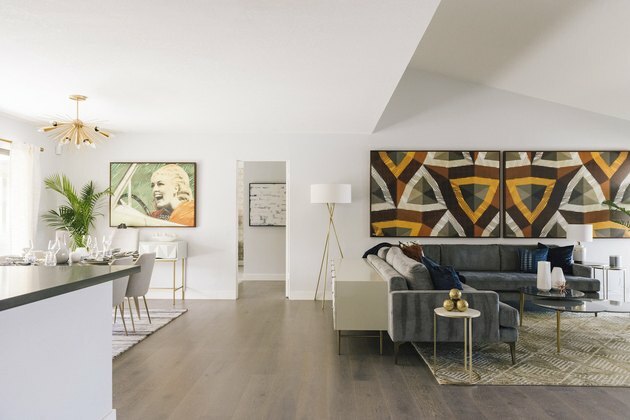 Its open layout is reimagined and refreshed, swapping out the era's common wood paneling for white walls and an abundance of natural light, which is accented by tropical colors and busy patterns to evoke both pool-house and midcentury vibes. But unlike most show houses, this one is for rent through Acme House Company, with a minimum 29-night rental ( rates fall around $650 per night ). The project provided an opportunity to connect with the local arts community. 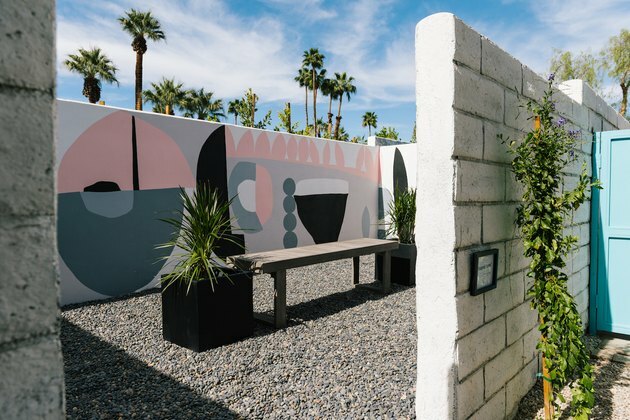 "A part of the magic of the house is that it is also a platform for local businesses and artists," says Wyndal Chapital, West Elm Palm Springs' manager. "The visibility of the house creates a spotlight for California artists like Sean Savage, Robert Landry, and Richard Prescott." 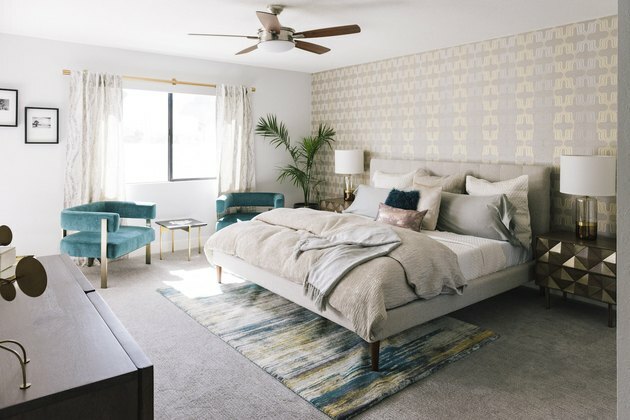 But above all, the rental is meant to be an immersive experience that balances new interiors with the legacy of Palm Springs: "When designing the interior, we wanted to evoke the glamour of that period while incorporating the uniquely modern design aesthetic and sensibility that West Elm is known for," explains Dru Ortega a public relations manager at West Elm. 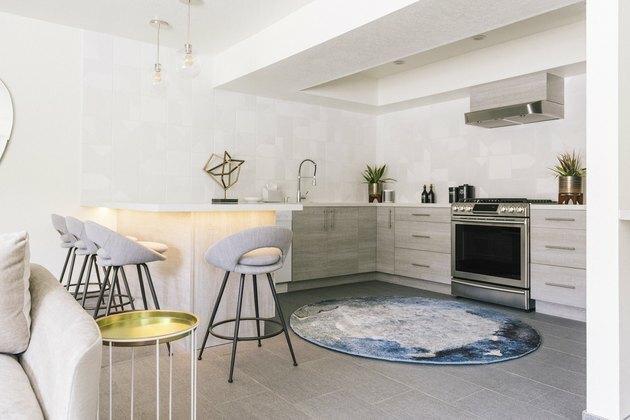 "It's all about creating effortlessly livable spaces that take advantage of the home's incredible mountain views, the year-round sunshine, and Palm Springs' heritage of midcentury modern design." The pool area was reworked to include a spa, tanning ledge, and even disco lights. 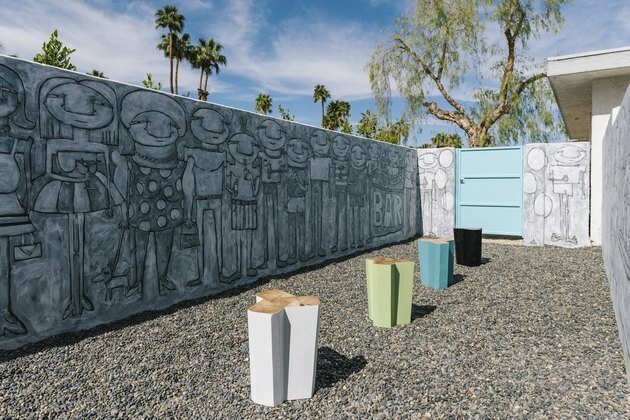 Five private-walled courtyards feature splashy murals by local artists and pieces from West Elm's outdoor furniture collection. Throughout the home, you'll find '70s-inspired fabrics and patterns, plus gold accents and heavily textured throw pillows and blankets. Statement art — as opposed to gallery walls — is in perfect balance with the furnishings, never fighting too hard for visual attention. An open layout gives way to a bright and airy kitchen. Neutral gray and ivory hues allow details like Edison bulbs, plants, and countertop pieces to stand out. Bar-height chairs evoke the 1970s with their bucket-shape design. Bright shades of salmon and turquoise ease the transition into the outdoors, just beyond the sliding doors. Gold-leaf wallpaper glams up one of the three bedrooms. Plush turquoise arm chairs, a potted fern, and sand-colored bedding evoke the beach or pool life. 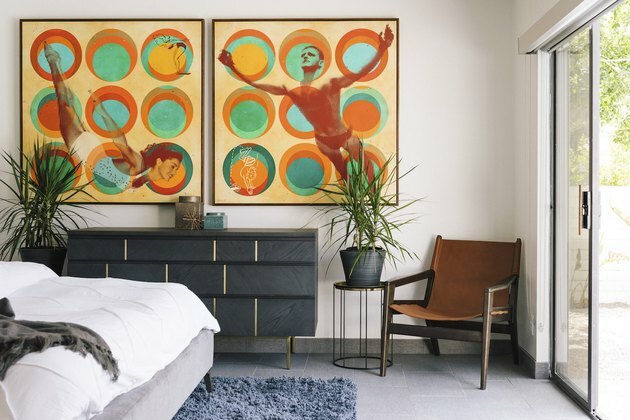 In another bedroom, splashy orange art contrasts the room's cool and earthy palette. Murals and installations by local artists are found throughout the property. 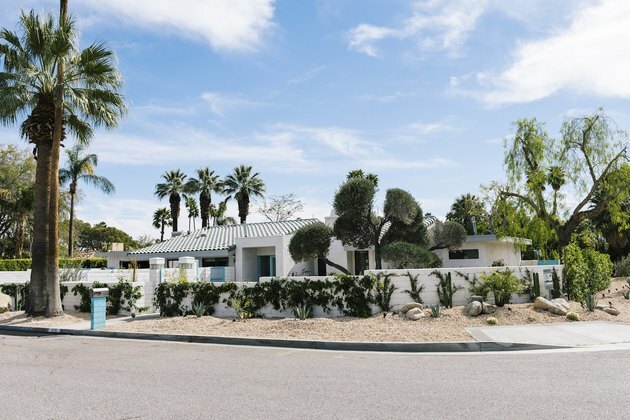 The house is located in an area of Palm Springs that has an iconic vintage legacy.